Elli has lost her parents, her home in New Zealand and everything she knows. Now she must live in England with family who are more like strangers. Life on her Uncle Len's horse farm seems so lonely - until Ellie meets Spirit. She's never seen the grey horse before, but she has the strangest feeling they've always known each other. Like Ellie, Spirit is alone in the world, and they form an intense bond. 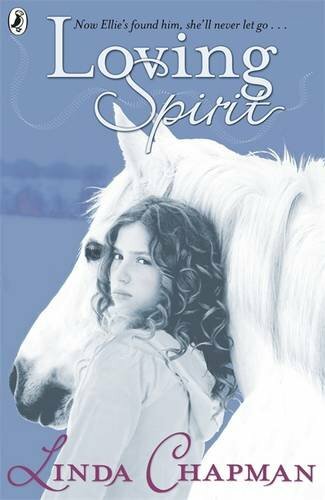 And as the weeks go by, Spirit helps Ellie to discover an incredible talent that changes both their lives forever.. I have never read a 'horse' book before so I was dying to give this one a go. I was also very intrigued by the fact this is Linda Chapman's first book for 9-12 year olds after writing many books for a younger audience. And I have to say it completely took me my surprise. In a very good way! I picked this one up just meaning to read the first couple a chapters, but a few hours later I had finished the whole book! It was very easy to read and I found myself really engrossed in the story. I have to say this is not just a book for horse lovers - the character relationships really made the story work for me - especially the relationship between Ellie and Joe. We meet Ellie just after her parents have been killed in a car accident and she is force to move to England to stay with her Uncle. He is very stern and strict - but Ellie stands up to him when she first arrives. She also bonds with her cousin Joe after an incident involving some kittens. Now I have to say I could have REALLY done without that part of the story but it does provide a great basis for her relationship with Joe and her distrust of Luke and her Uncle Len. Once we meet Spirit I loved the direction the story took. I don't want to say too much because it was a surprise for me and I love that the book's synopsis hints at a connection between Ellie and Spirit but leaves the best for you to discover as you read the book. I'm glad this is part of a series. I am looking forward to the next one to see what happens next. I want to see if Uncle Len is a 'bad' as he initially seems or whether Ellie's presence will mellow him. Luke promises to be an interesting character I think so I am intrigued by how he will progress and I can't wait to see what happens next between Ellie and Joe. They have such a great friendship that I'm excited to see what direction Chapman decides to take it. Well I would have said this is really not my kind of thing as well but it sounds really moving. I am going to add it to the list of books for the library because my girls love anything to do with horses.